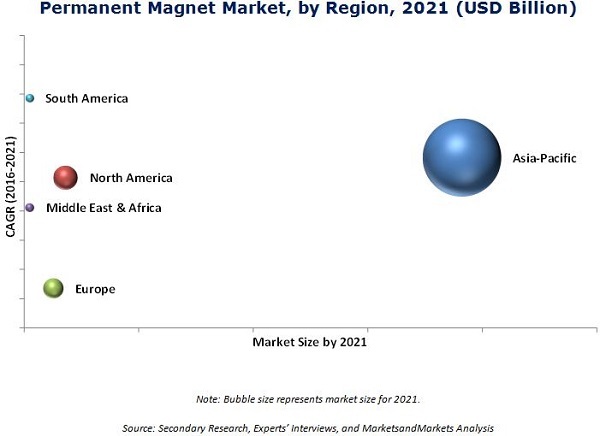 [169 Pages Report] The Global Permanent Magnet Market was valued at 13.57 Billion in 2015 and is projected to reach 22.67 Billion by 2021, at a CAGR of 8.8% from 2016 to 2021. In this report, 2015 is considered as the base year and the forecast period is from 2016 to 2021. Mining and extraction of the required metal ore is the first stage of the value chain for permanent magnet product. Separation process play a significant role in determining the final properties of permanent magnet products and, hence, their usage and application. A number of techniques and processes are used to obtain magnetic materials. The manufacturer uses these metals to form metal alloys and magnet powders. The key manufacturers of permanent magnet include Hitachi Metals Ltd. (Japan), Daido Steel Co., Ltd. (Japan), and Molycorp Magnequench (Canada). This report categorizes the global market for permanent magnet on the basis of type, end-use industry, and region. The global permanent magnet market was valued at USD 14.90 Billion in 2016, and is projected to reach USD 22.67 Billion by 2021, at a CAGR of 8.8% during the forecast period. 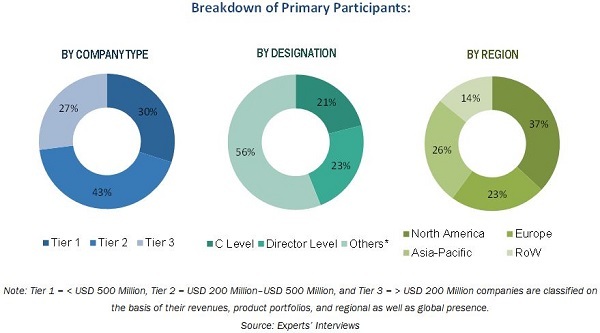 The growth in end-use industries and initiatives of associations and regulatory bodies are expected to drive the market during the forecast period. The global permanent magnet market is classified based on type into neodymium iron boron magnet, ferrite magnet, samarium cobalt magnet, alnico magnet, and others. The neodymium iron boron magnet segment is expected to lead the global permanent magnet market during the forecast period, followed by the ferrite magnet segment. The neodymium iron boron magnet segment leads the market due to its growing use in the consumer electronics industry. This segment is also expected to witness the highest CAGR from 2016 to 2021. The main features of neodymium iron boron magnet are high heat resistance, coercivity, and remanence. The global permanent magnet market is classified based on end-use industry into consumer electronics, general industrial, automotive, medical technology, environment & energy, aerospace & defense, and others. Automotive is the fastest-growing end-use industry. This is due to the growing automobile sales. In addition, the increase in use of permanent magnets in applications such as auto-clutch, sensors, switches, and electric power steering is also driving the permanent magnet market. The global permanent magnet market is segmented based on region into Asia-Pacific, Europe, North America, Middle East & Africa, and South America. Currently, the Asia-Pacific region is the largest market for permanent magnets. Rapid industrialization and improved living standards are expected to drive the increasing demand for permanent magnet in this region. The region is also projected to be the second-fastest growing market from 2016 to 2021. This growth is attributed to the rapidly growing automotive industry in the region. The major factor restraining the growth of the global permanent magnet market is the fluctuating cost of raw materials. There have been fluctuations in prices of rare earth metals and other such raw materials used to manufacture permanent magnets. This affects the quality and quantity of permanent magnets produced. This sometimes results in reduced consumption of permanent magnets and also tarnishes their image of being cost effective materials. Some of the key players in the global permanent magnet market are Hitachi Metals, Ltd. (Japan), Daido Steel Co., Ltd. (Japan), TDK Corporation (Japan), Shin-etsu Chemical Co., Ltd. (Japan), Arnold Magnetic Technologies (U.S.), Lynas Corporation Ltd. (Australia), Electron Energy Corporation (U.S.), Tengam Engineering, Inc. (U.S.), Adams Magnetic Products Co., Inc. (U.S.), and Bunting Magnetics Co. (U.S.), among others. 10.2.2 Shin-ETSU Chemical Co., Ltd.
11.2 Daido Steel Co., Ltd.
11.4 Shin-ETSU Chemical Co., Ltd.
11.9 Adams Magnetic Products Co., Inc.
11.11 Yantai Shougang Magnetic Materials Inc.